With dozens of Zoos & Aquariums across the country, there is bound to be one that offers savings near you! Check out your Abenity discount program page to plan your end-of-summer visit! Georgia Aquarium is the world's most inspiring aquarium with over 8 million gallons of water the top Atlanta attraction, right in the heart of downtown. With your Abenity discount program, you can save 10% on General Admission tickets. So swim on over and "sea" what all the fuss it about! 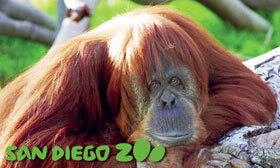 An urban paradise for all ages, the San Diego Zoo is a must-see in Southern California. Spend the day monkeying around in our tropical oasis as you visit amazing habitats for animals such as gorillas, tigers, sun bears, flamingos, mandrills, polar bears, birds of paradise, giant tortoises, leopards and more. Abenity discount program members can save up to 5% off General Admission tickets so grab your favorite monkeys and come by for a visit!